Trivandrum, 6 August 2012: The State government has launched a job portal featuring opportunities for job seekers in the country and abroad. The website launched on behalf of Overseas Development and Employment Promotion Consultants (ODEPC) was opened by Minister for Labour and Rehabilitation, Shibu Baby John. ODEPC is the official agency of the state which deals with the recruitments abroad. The webportal which is regarded as the first of its kind by a state government is available at www.odepc.kerala.gov.in. The website will display jobs from both private and public sectors. Job seekers can register at the website for a nominal fee ranging from Rs. 100 to Rs. 600. They can then update their profile and find matching jobs. The job search can be done in four folds - By employer, By industry, By Functional area and By job role. 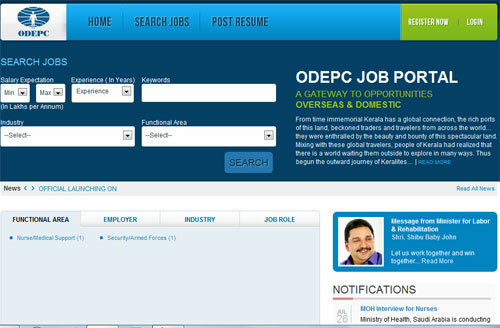 ODEPC has started online registration for Overseas as well as Domestic Recruitment. Job seekers can register for Domestic or Overseas Recruitment. The payment details are available in the web site.